Woodruff SC has a rich history, just like many of the other towns and cities in South Carolina. The earliest landmark in the area was The Church of Christ on Jamey’s Creek, chartered in 1787. The creek that the church was named after is now called Jimmie’s Creek. People came from all over the state to attend the church. The man who bought the land that is now Woodruff had two sons, one of which was named Thomas Woodruff. Thomas dreamed of making Woodruff into a town, and his two sons made that dream a reality, but he did not live long enough to see it happen and his sons named the town after him. The town was officially chartered in 1874, and that’s when people started coming to the town to establish their businesses. 1885 marked the official installation of the town’s railroad, and the town hasn’t stopped changing and growing since. Today, Woodruff has a population of 4,100 people and offers so much to its residents. There’s a farmer’s market once a week in the warmer months until the end of September. Woodruff also created the Greenway Trail in 2014, which is a trail used for running, biking, and walking. It’s only .85 miles, and a little more depending on where you start from, but the city is looking to expand it. Just like Woodruff is expanding its economic and properties, it is also looking to expand the number of residents it has. Woodruff has plenty of homes for sale, perfect for anyone no matter the family size or interests. 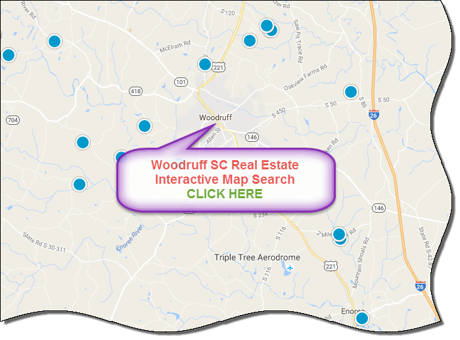 Woodruff is part of Spartanburg county and is located 30 minutes from the city of Spartanburg and 35 minutes from Greenville. It is 30 minutes from Croft State Park, about an hour from Lake Greenwood and Lake Hartwell, and 30 minutes from Lake Bowen. If you’re not much of an outdoor enthusiast, Woodruff has its own events and activities, as do Spartanburg and Greenville. They all have something for everyone, regardless of interests. Of course, aside from events and activities, there are plenty of opportunities for work and school as well. Woodruff is part of Spartanburg county school district number 4, which is ranked highly against other districts in the state in categories such as best sports, best extracurriculars, and best district. For secondary education opportunities, there are numerous nationally recognized and accredited colleges and universities within a 30-mile radius. With a rich history, plenty of events and activities in and around the city, wonderful commute times to work and school, Woodruff SC is the perfect place to live. There are plenty of homes for sale in Woodruff SC to fit your wallet, family size, and style preference. If you're looking to buy or sell a home in the Woodruff area, contact the PRODUCER Realty expert real estate team at 864-438-5050.